- Reach your genetic potential in 6 months? - Sleep 2 hours per day and perform better than on 8 hours? - Lose more fat than a marathoner by bingeing? - How to pay for a beach vacation with one hospital visit And that's just the tip of the iceberg. There are more than 50 topics covered, all with real-world experiments, many including more than 200 test subjects. You don't need better genetics or more discipline. You need immediate results that compel you to continue. That's exactly what The 4-Hour Body delivers. TIMOTHY FERRISS is a serial entrepreneur, #1 New York Times bestselling author, and angel investor/advisor (Facebook, Twitter, Evernote, Uber, and 20+ more). 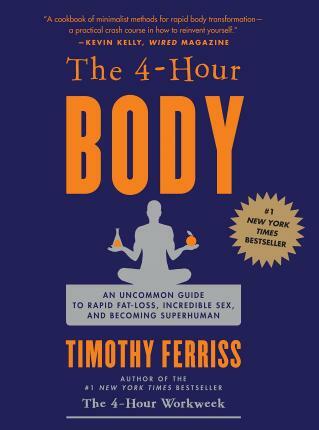 Best known for his rapid-learning techniques, Tim's books -- The 4-Hour Workweek, The 4-Hour Body, and The 4-Hour Chef -- have been published in 30+ languages. The 4-Hour Workweek has spent seven years on The New York Times bestseller list. Tim has been featured by more than 100 media outlets including The New York Times, The Economist, TIME, Forbes, Fortune, Outside, NBC, CBS, ABC, Fox and CNN. He has guest lectured in entrepreneurship at Princeton University since 2003. His popular blog www.fourhourblog.com has 1M+ monthly readers, and his Twitter account @tferriss was selected by Mashable as one of only five "Must-Follow" accounts for entrepreneurs. Tim's primetime TV show, The Tim Ferriss Experiment (www.upwave.com/tfx), teaches rapid-learning techniques for helping viewers to produce seemingly superhuman results in minimum time.